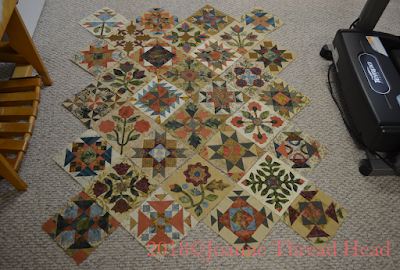 It is 16"x28, with 4" blocks. I used a Marti Michell Pineapple ruler set for these blocks (with 1/2" finished strips). It was very easy to cut out, and enjoyable to sew. Simple all over meander free motion quilting (because it is my favourite to stitch). 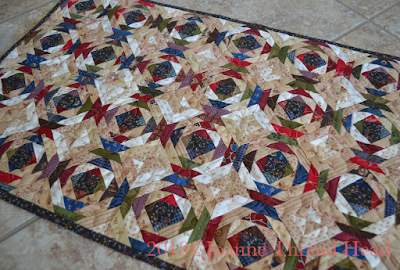 I used 2 layers of cotton batting, and regular Aurifil thread for the quilting. 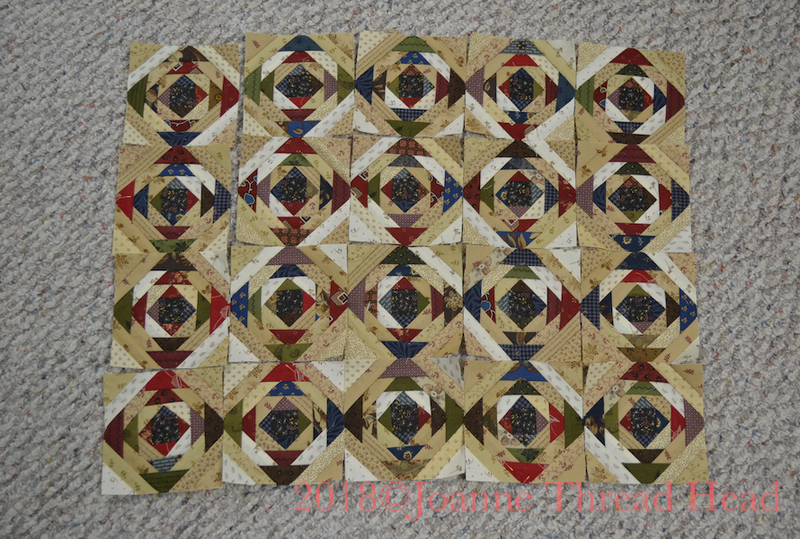 This is last week's block for the Temecula Quilt Company 1880 Sampler sew along (also a 4" block). Using yarn that I recently spun. 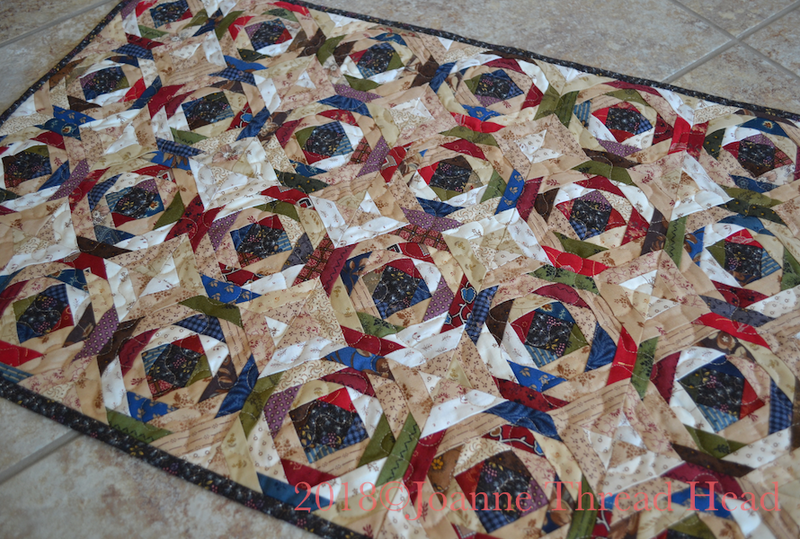 The pattern is Vitis by Liza Mutch. 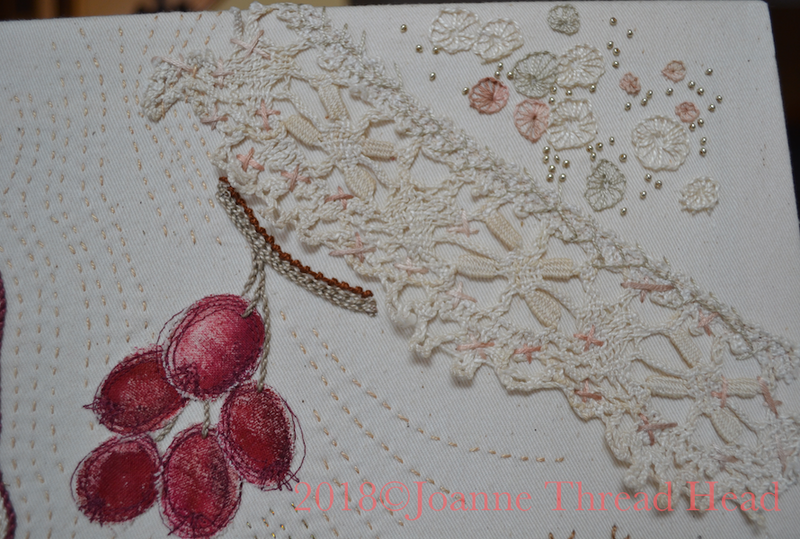 More detail can be found on my Ravelry project page. I finished spinning four more skeins of yarn from the fleece I was given last fall. 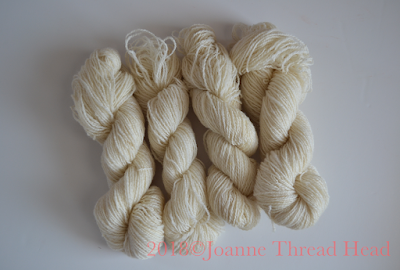 I have spun 335g, and over 1000m of yarn so far. 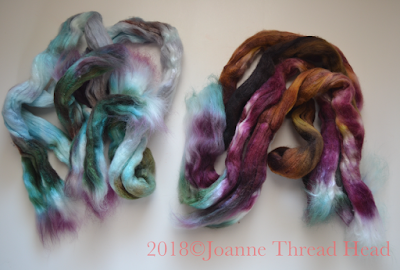 I probably have about 200g of fibre left to comb and spin (plus a couple more fleeces outside, frozen in a shed waiting for spring so I can get them ready for spinning). 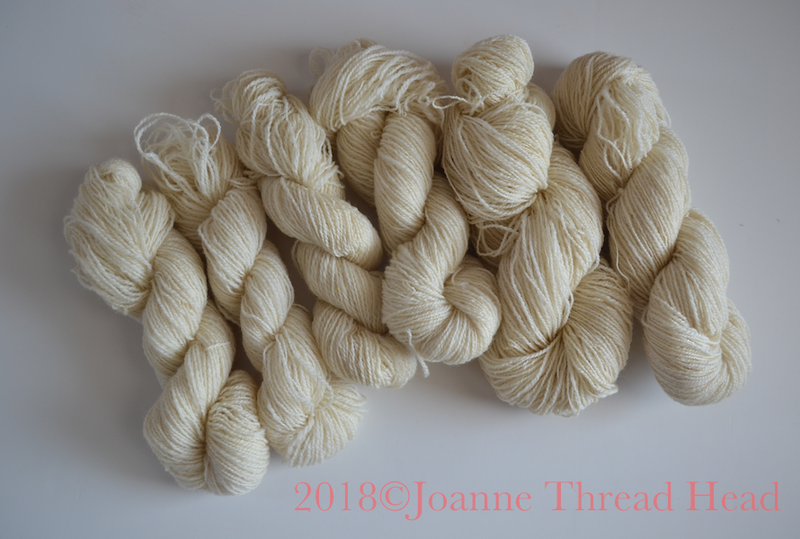 I plan on dyeing the skeins different colours to crochet into a 'scrappy' Granny Stripes blanket (at least that is the plan this week!). I am really happy with how it turned out! 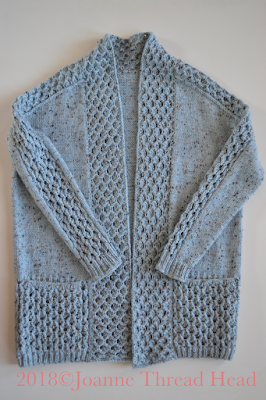 The pattern is Tealeaf Sweater by Bristol Ivy, it was part of my Year of Craftsy - the videos were really wonderful to go along with the pattern, it made knitting the sweater so easy. 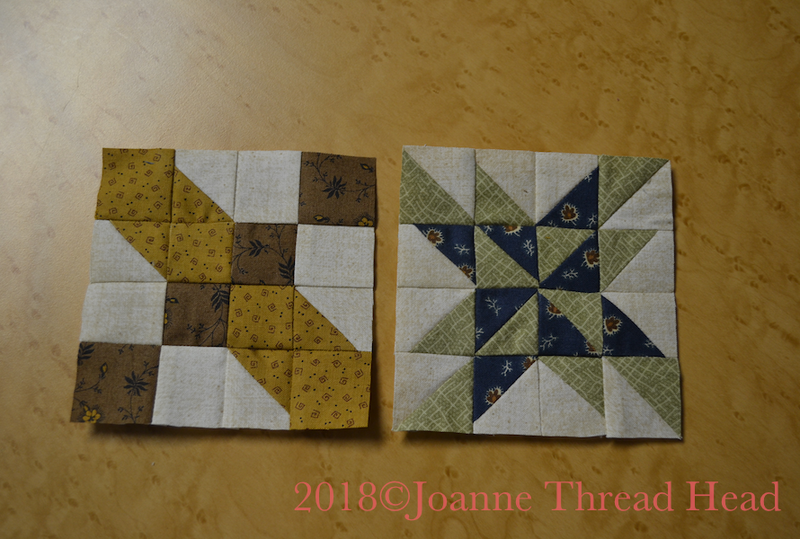 There were a few 'new-to-me' elements that I really enjoyed learning - Japanese short rows for one, and a couple of different bind-offs which created nice edges. The lace was so easy to knit. 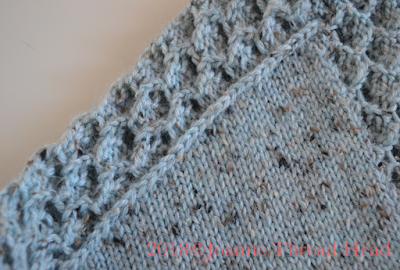 I thought that this slip stitch edge created a nice feature along the shoulder too. 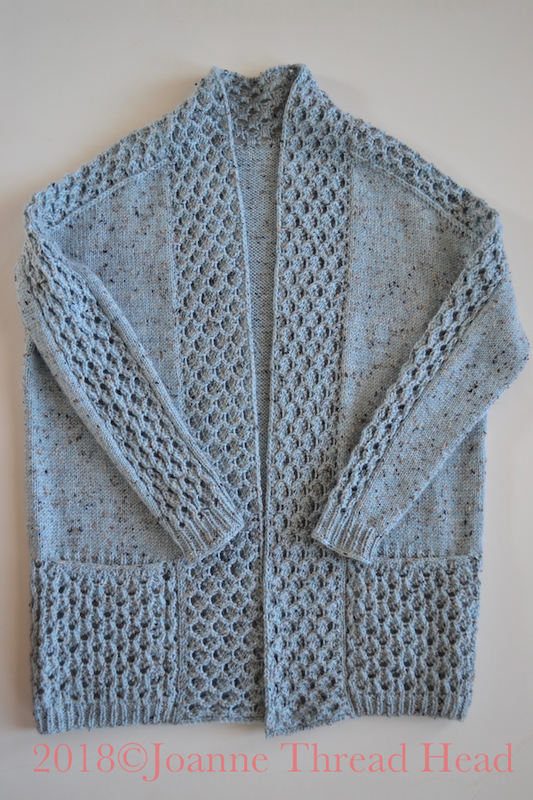 I made a few changes to the pattern and all the details for my project can be found on my Ravelry page. 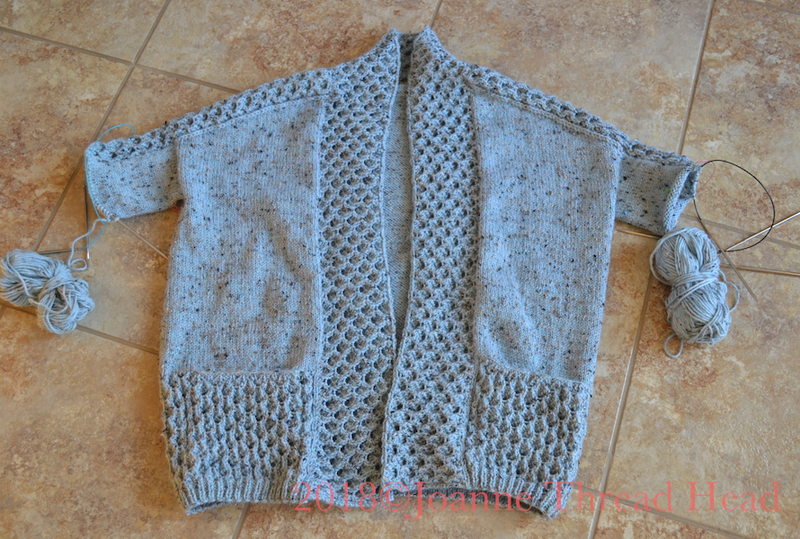 The body of the sweater is oversized and the arms are fitted. The yarn I used was Wool of the Andes Tweed by Knit Picks, in the colour way North Pole Heather - it is very soft and I can even wear it on my bare skin (rare for me). I think this will be a very practical sweater through out the year. 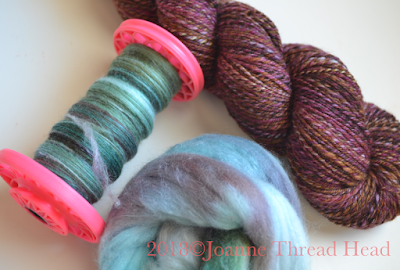 I also finished spinning the second skein (the blue/green one in the photo) of yarn from fibre that I recently won. 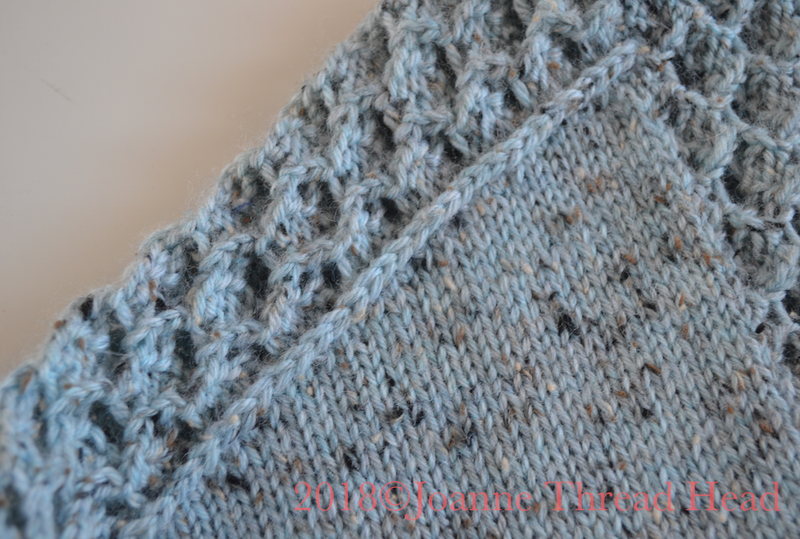 The fibre is by Hello Yarn in the colour way Snail's Pace. It is an Organic Polwarth/Silk blend (80/20). 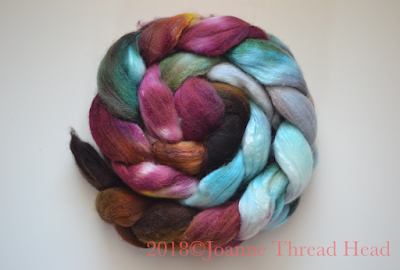 I divided the braid into light and dark to spin - something else I have never tried (I usually dye my own fibre, so when I want two colours, I dye two colours). 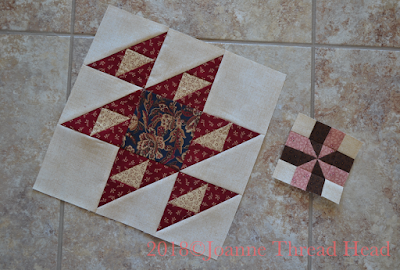 I am participating in a spin-along/make-along over on Ravelry with this project. 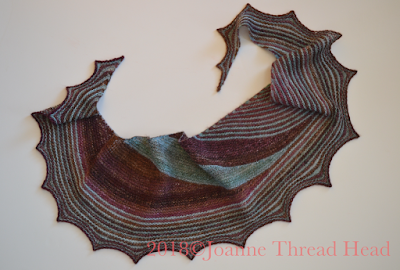 I started knitting Vitis by Lisa Mutch. The pattern was available for free last week as I was finishing up spinning, and I thought it would be perfect for the yarn. 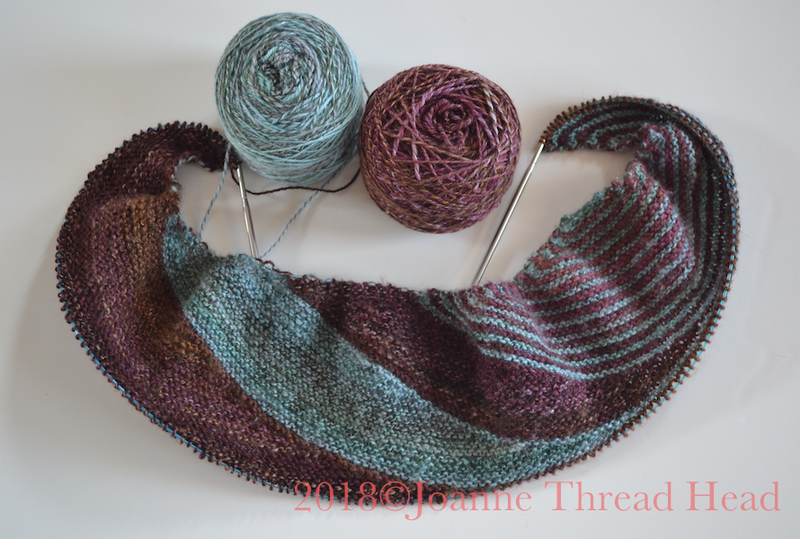 I don't have the size yarn or the amount of yarn that the pattern calls for, so I made a few changes to the pattern (smaller needles, smaller sections...), and mine will end up being much smaller than the pattern. These are so much smaller than the other Pineapple blocks I pieced recently (and more enjoyable to sew too). 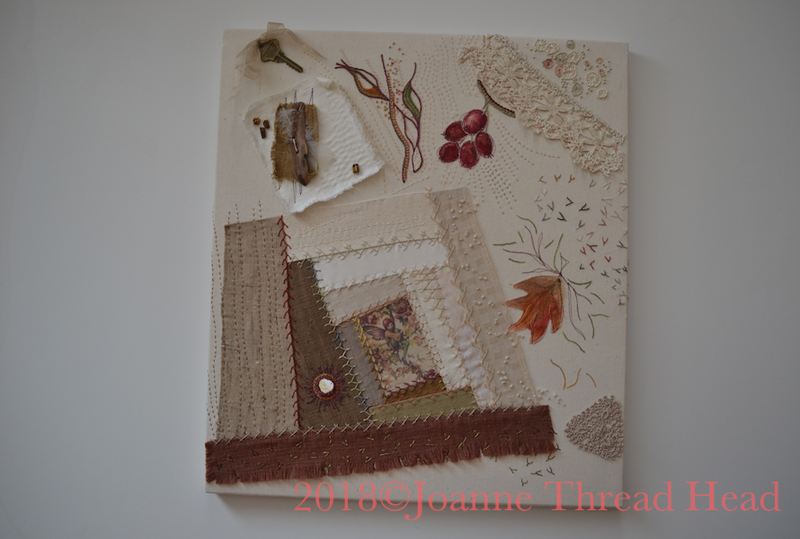 I have really enjoyed concentrating on one project for one week over the past few weeks! 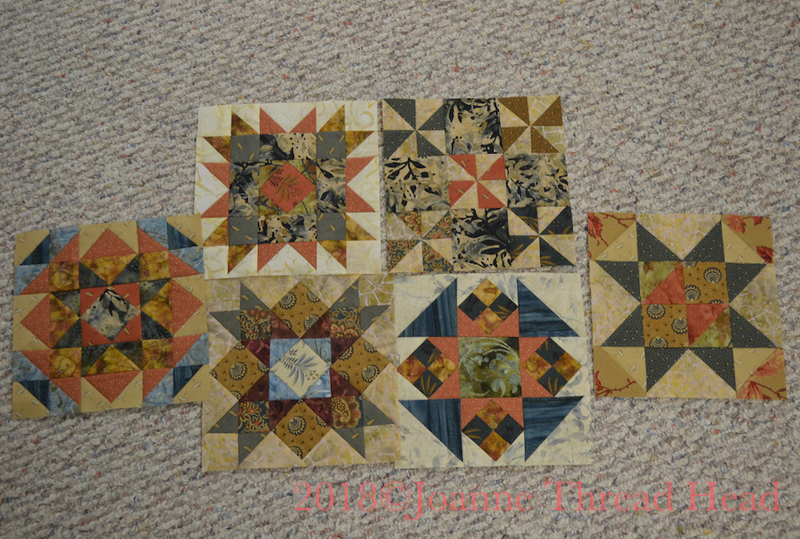 I pieced six quilt blocks this past week. 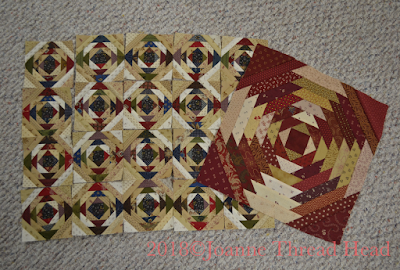 These are the last of the blocks for a quilt that started as a quilt along with a couple of friends (we all seemed to have lost interested over the years). It was started about 5 years ago. 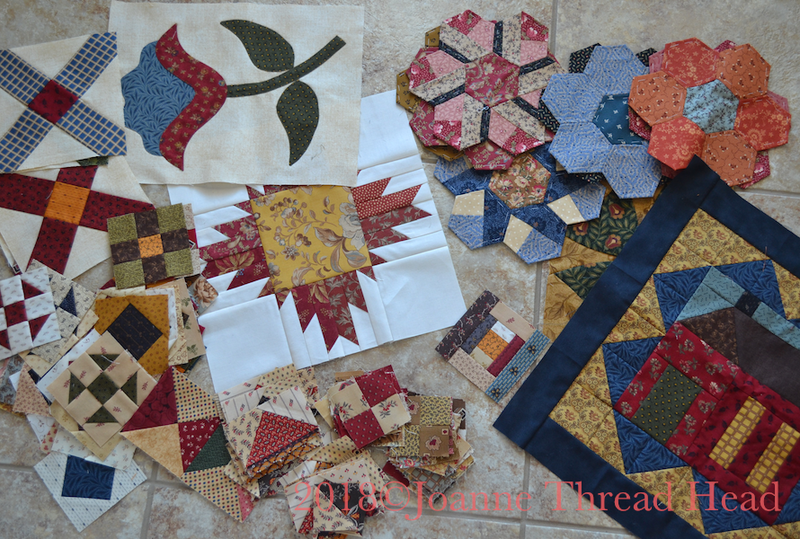 There are pieced and appliquéd blocks in this quilt (7.5" blocks). 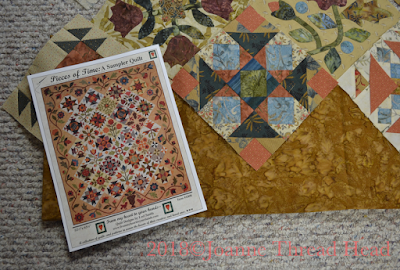 The quilt is Pieces of Time by Lori Smith . 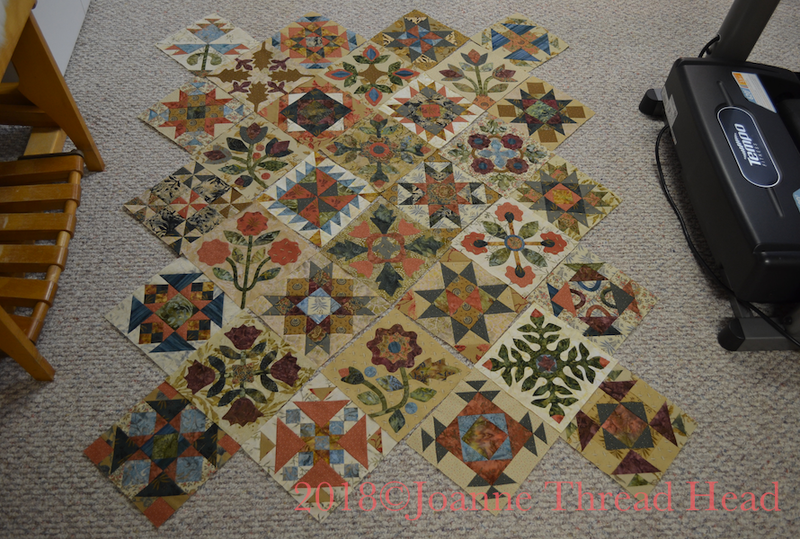 Now to work on the appliqué border. 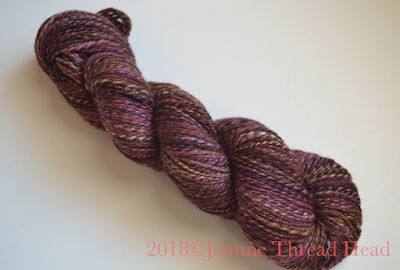 I also finished a skein of yarn from a fibre bundle that I recently won. It is a beautiful Polwarth and Silk blend. 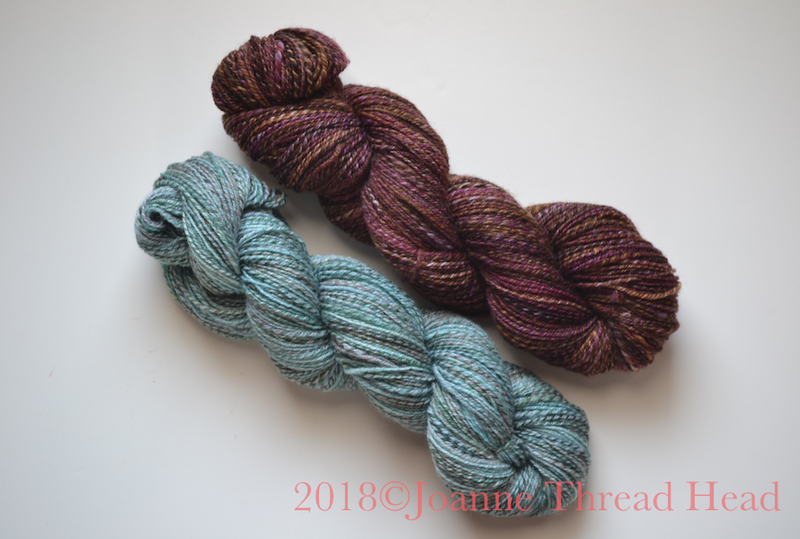 I divided the bundle into light and dark to spin two different skeins, to then knit together in a project (I still haven't decided on what yet). 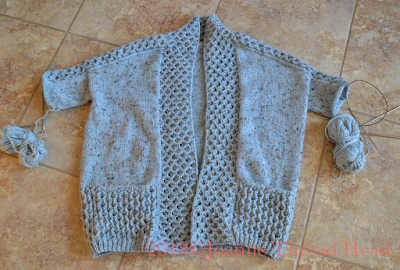 My Tealeaf Sweater is coming along nicely. This week I finished the neck band and started the sleeves - they look really short but because of the drop shoulder they are already past my elbows. This week I finished off a piece of embroidery I had started a couple of weeks ago. 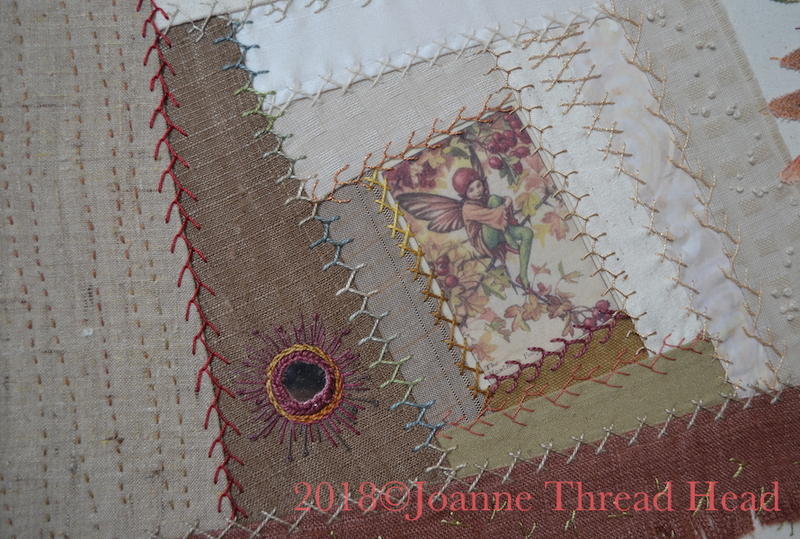 It was inspired by the Craftsy class 'Fabric Play: Sewing Mojo Minis' with Suzy Williams of Suzy Quilts (part of my Year of Craftsy). It started as a simple free form Log Cabin block, and I knew that I would add embellishments to it to make it my own. 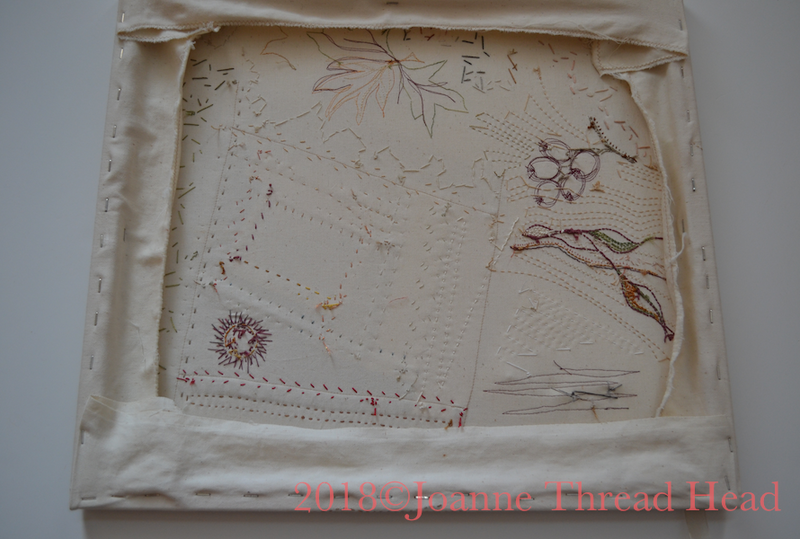 It includes machine embroidery, fabric painting, lots of hand embroidery for texture. The centre of the Log Cabin is a scan of an image from a book that I printed on fabric (nothing fancy, I just ironed a piece of fabric to some freezer paper and ran it through the printer). The one thing that this piece doesn't have that I usually attach to my regular Crazy Quilting is buttons - stepping out of my box! 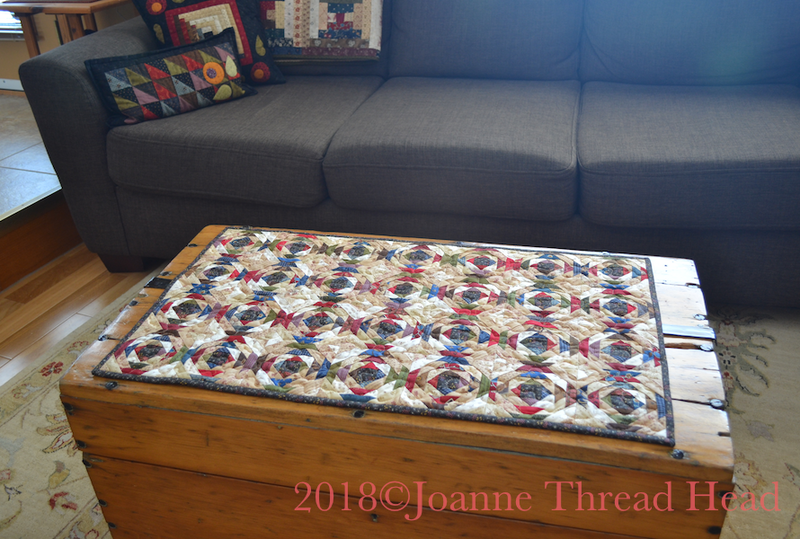 I attached the piece to stretcher bars to hang it - keeping it simple. 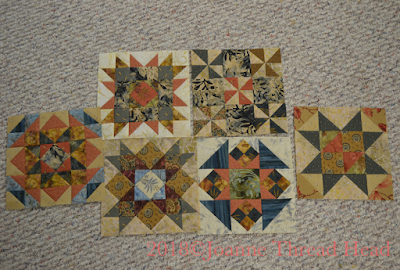 This week I also pieced a couple of quilt-along blocks. 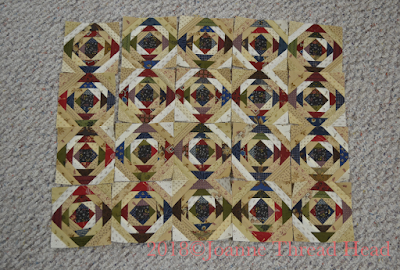 The large one is Wandering Lover, the first block from the 2018 BOM Antebellum Album by Barbara Brackman over at Civil War Quilts - it is a 12" block. The small one is the first block from the sew along called 1880 Sampler over at the Temecula Quilt Company blog - it is a 4" block. 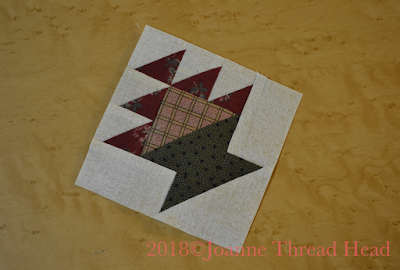 I plan on adding the blocks to other leftover blocks that I have to make an Orphan Block quilt (you might recognize some blocks from a couple of quilt alongs last year that I didn't like how they were progressing). 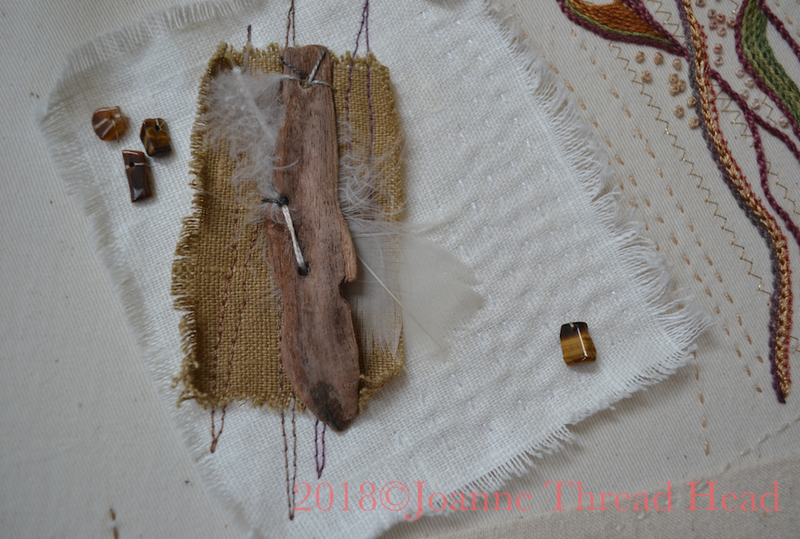 This week I really concentrated on knitting. I finished knitting the body, saddle shoulders and started on the neck band for the Tealeaf Sweater. 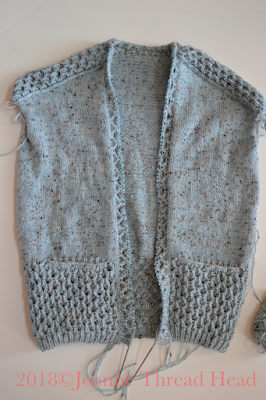 I will knit the sleeves last because the neck band is quite wide and I want to make sure of the sweater's fit when I am knitting the sleeves (they are knit top down and the sweater has drop shoulders).